Maria Antonina Czaplicka from her book, My Siberian Year. Image from Wikipedia. 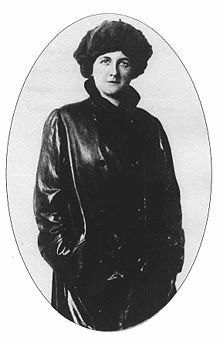 Maria Antonina Czaplicka¬†was born on October 25, 1884, in the Stara Praga district of Warsaw, Poland, to an impoverished Polish nobility family. Little is known of her early life, but eventually she went to study at Flying University, an underground institution of education while Poland was held by Russia. She worked her way through university, holding jobs such as a teacher, secretary, and writing poetry. In 1910, Maria received a scholarship that enabled her to study at the London School of Economics and the Somerville College of Oxford in the United Kingdom. She utilized her Russian language skills to research and publish her first book, Aboriginal Siberia, which looked at the literature of native tribes in Siberia. Maria had never visited Siberia, but her book became a major reference work in the field of cultural anthropology. In 1914, following publication of her book, Maria was part of an expedition conducting fieldwork in Siberia. She arrived in Russia shortly before World War I broke out, and she remained with Henry Usher Hall (of the University of Pennsylvania Museum of Archaeology and Anthropology) to continue their work despite the war. Accompanied by a Tungus woman, Michikha, Maria spent the winter traveling along the Yenisei River and taking photographs and notes on the people of Siberia. She also helped collect 193 objects, which she donated to the Asian collection at the Museum of Archaeology and Anthropology. A diary of her travel, My Siberian Year, was published in 1916. That same year, Maria became the first female lecturer in anthropology at Oxford University. She specialized in the Siberian tribes, nations of Central and Eastern Europe, and Polish issues. She would go on to teach at the University of Bristol in 1919. Despite this success, Maria had many financial troubles ‚Äì especially in securing funding to continue her work. In 1921, she poisoned herself after not receiving a travelling fellowship. Many of her works ‚Äì including books and articles ‚Äì remain major reference works in anthropology studies of Siberia.